Guest column by Rubela Jhonnie. There has been a lot of hoopla around sustainable living lately. To give a push to this eco friendly drive, one must adopt green living diktats on a larger scale. This can be done by taking on green living fundamentals not only at home but also in office. Countless items such as newspapers, magazines, tissues, cartons, eatables and cutlery are used in offices daily along with resources like water and energy. A few tricks to pare down excessive usage of consumables in offices are given below. There are so many ways to economize the use of paper in offices. Recycle stacks of newspapers, magazines and official documents or give them out to a charity. Make new objects like dustbins or table mats from them. To minimize the scores of printouts taken, read from soft copies as far as possible. If you cannot do without a printout, then take it on both sides of the sheet and choose a smaller font size so that lesser amount of paper is utilized. Buy clean and green products for your office. Chuck the disposable cups for ceramic ones and avoid drinking bottled water to reduce the amount of litter generated. Soaps and cleaning products should be biodegradable and free of chemicals. Office paraphernalia like pens, pencils, envelopes, printer cartridges and folders should be purchased from companies selling eco friendly merchandise. Even tea, coffee, biscuits, chips and other victuals for offices should be purchased from companies vending organic and Fair Trade certified eatables. Try to procure office supplies in bulk to reduce packaging and waste created during shipping. Go green while furnishing your office by doing up the place with chairs, desks, conference tables and drapes made from recycled and reclaimed material. Buy second hand furniture from thrift stores. Bulbs burn up a lot of energy and should be swapped with energy saving gadgets like florescent lights and LEDs. Indoor plants, which can purify air, should be added in and around the office. Towels, table covers and coasters made from bamboo, jute or recycled cloths are a great pick. Make sure you do something about the oodles of water and energy used in offices. Unplug appliances like printers, scanners and microwaves that are not used all day. Tune energy saving settings on your computer and shut down the workstation when you are at a meeting, out for a lunch break or leaving for the day. Install large windows that keep the interiors well lit and airy to reduce dependence on lights and air conditioners. Do not leave taps running and fix all leaky faucets. There is no need to burn the fast depleting fossil fuels by driving your car to office everyday when you can opt for greener modes of transportation like public buses and trains. If your office is nearby then try biking or walking. If you have colleagues living nearby then try carpooling. Use a motorbike, hybrid auto or electric vehicle inst ead of your gas guzzling car. People spend a lot of time at their offices; even more than they spend at home. 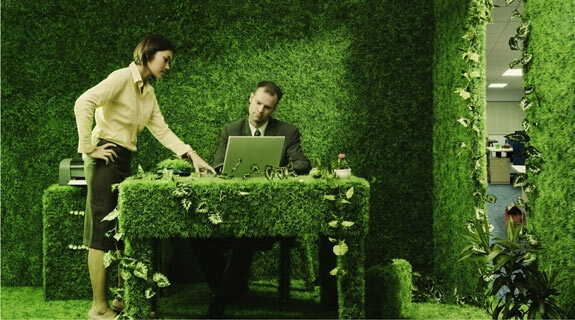 Therefore, society just cannot do without embracing green living at the workplace. Expanding the green movement to offices is definitely a good thing for everyone. About the author: Rubela is a blogger by profession. She loves writing on technology and luxury. Beside this she is fond of gadgets. Recently an article on cloud seeding attracted her attention. These days she is busy in writing an article on bathroom ideas.